Edgar Whitney, Frank Webb, Charles Reid and other nationally known watercolorists. 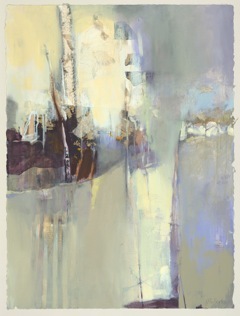 In 1985 she returned to college and achieved BFA and MFA degrees in painting from the University of Wyoming. She was a college art instructor at Laramie County Community College from 1990 to 2003 in Cheyenne, WY. In 2003 she made the leap of faith to relocate and paint full-time in Taos, NM. Following several successful exhibitions, during her 8 years in Taos, Fullerton made her mark and established her reputation as a well-known and respected artist and teacher. A recent move to south Denver, she is now hosting workshops in her studio and teaching across the nation. Her work has been in galleries, juried shows and museums since the early 70's and she has shown internationally in Italy and Japan. Her work was recently published in the 2010 edition of Open Studios Press and the Society of Layerists in Multi-Media book, Visual Journeys, Art of the 21st Century. Joan has instructed all levels of experience and ages of painters. Students in Fullerton's classes thrive in the atmosphere of her informative and relaxed classes. It is her belief that people are open to learning and creativity when they are having fun. She is adept at demonstrating a multitude of techniques. Beginning students will find encouragement and confidence, while more advanced students will benefit from her insightful solutions to their creative challenges. Joan offers classes in watercolor, oil, acrylic and mixed media collage, creating both abstract and representational subjects. See her art work: www.JoanFullerton.com. "Fullerton's enticing teaching style has charmed and inspired painting students in college classes and in workshops across the nation. Her diversity of style and use of media attracts both collectors and curators, who have honored Fullerton with one person shows it the United States, Italy and Japan."